- Publisher It's school spirit day at Blossom Hill School, and even the students' new teacher, Miss Hershey, is joining the wacky fun. Yet when the new girl dares the Cul-de-sac Kids to guess her secret, they all try to uncover the mystery. - Publisher It's school spirit day at Blossom Hill School, and everyone's enjoying the fun. Especially Abby Hunter's teacher, Miss Hershey. She does all sorts of wacky things, like wearing her clothes backward. And there's the new girl at school with a BIG secret. Leslie Groff--with bright red pigtails--dares Abby's class to guess her secret. In just one school day! Can the Cul-de-sac Kids do it? Or will spunky Leslie outsmart them all? 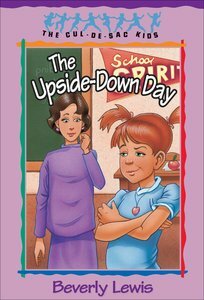 About "The Upside-Down Day (#23 in Cul-de-sac Kids Series)"
It's school spirit day at Blossom Hill School, and even the students' new teacher, Miss Hershey, is joining the wacky fun. Yet when the new girl dares the Cul-de-sac Kids to guess her secret, they all try to uncover the mystery. It's school spirit day at Blossom Hill School, and everyone's enjoying the fun. Especially Abby Hunter's teacher, Miss Hershey. She does all sorts of wacky things, like wearing her clothes backward. Beverly Lewis was born Beverly Marie Jones in 1949, in Lancaster, Pennsylvania, and grew up in the heart of 'Pennsylvania Dutch' country. She played and composed on the piano and wrote avidly from a very young age. Beverly's father was an Assemblies of God pastor, and she was raised in that denomination. However, she became fascinated with her ancestral links to the Old Order Mennonite community into which her maternal grandmother, Ada Buchwalter, had been born. Beverly's deep affinity for her Amish heritage has inspired much of her prodigious literary output - over eighty books for both children and adults. Beverly graduated from Evangel University with a degree in Music Education, and became a schoolteacher. When her own three children were middle school age, Beverly began submitting stories to children's magazines. Her first book Mountain Bikes and Garbanzo Beans was published in 1993. Beverly's first adult fiction, published in 1997, was the Heritage of Lancaster County trilogy, about the experiences of a young Amish woman Katie Lapp as she moves from the plain traditions of her upbringing into the modern world. Beverly has followed this award-winning bestseller with a stream of popular titles that have established her as one of our time's most beloved storytellers. Her titles include the Cul-De-Sac Kids, the Girls Only (GO! ), and the Holly's Heart series for children, and the Amish based Rose, Seasons of Grace, Abram's Daughter, The Courtship of Nellie Fisher, and Annie's People series. She has received numerous awards including two Silver Angel Awards for her novels The Postcard and Annika's Secret Wish, and a Golden Book Award for The Shunning, the first volume of her Heritage of Lancaster County series. "When I'm between writing deadlines, I enjoy hiking in the Rocky Mountains with my husband. Cooking from scratch, playing Mozart at the piano, and making family memory albums, as well as traveling to meet my devoted readers during book tours, are some of my very favorite things. I also adore reading biographies and memoirs, as well as classic literature." She makes her home with her husband David in Colorado. In addition to their three adult children, they have three grandchildren.